SuperFabric brand technology is a finishing process that creates protective fabrics engineered for optimum resistance to cuts, punctures and abrasions while remaining flexible. d3o has brought the next generation of their impact protection material to the table; it is much softer than the original d3o formulation, 25% lighter, and provides even better performance. Together, they are offering the "ultimate motorcycle garment"; multi function motorcycle protectors certified to EN1621-1. SuperFabric® brand technology takes a base fabric such as nylon, polyester, etc. and overlays it with tiny, hard plates (“guard plates”) in a specific arrangement. The gaps between guard plates allow complete flexibility and are small enough to resist sharp objects from penetrating. By using d3o™ SuperFabric® protectors you have the added security of knowing that you are not only protected by d3o™’s intelligent molecules, but also by the high performance abrasion shield that SuperFabric® brings. The d3o™ components can be provided on a SuperFabric® panel which can be stitched into the motorcycle garment in strategic locations where both impact and abrasion protection is needed, like any other panel piece so integration is simple. d3o™ will be developing this solution for motorcycle and other sports with strategic partners this year. 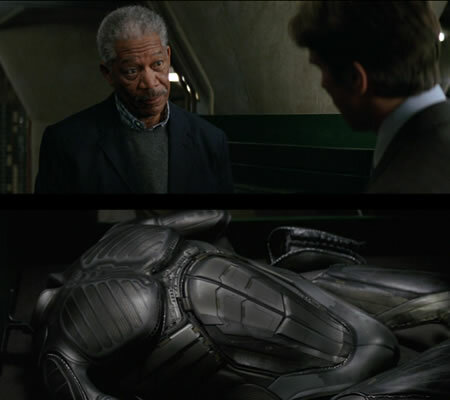 SuperFabric with d3o is exactly what you want for that special suit you've been thinking about - especially if you don't have Morgan Freeman spending billions on R&D from your huge corporation. Learn more about d3o in Skiers Get d3o-Based 'Impact Suits' and d3o-based RibCap: Flexible-Rigid Beanie-Helmet For Snowsports .